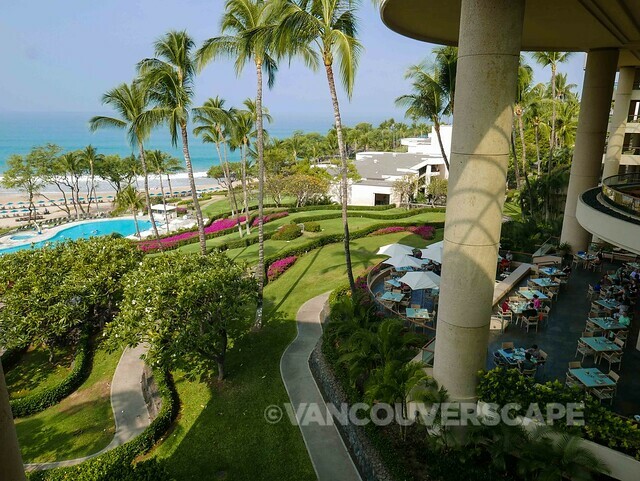 Our final days on the Big Island are spent at Hapuna Beach Prince Hotel, a luxury resort on the Kohala coast. Upon check in, we’re greeted at the front desk with a cool towel and glass of chilled orange/passion fruit juice. All 350 ocean-facing rooms are spacious and well-organized with an upholstered bench/shoe rack at the foot of the bed, lots of drawer and counter space, a full-size working desk with outlets for tech and a spacious lānai with table, chairs and lounge chaise. Our room also has a large flat screen TV and wicker chair with Hawaiian print upholstery and a round end table for relaxing near the king bed. I like the large bathroom: a shower, bathtub, double sinks and separate toilet area. Outside the bathroom’s a marble counter with coffee and tea-making supplies and a cabinet that hides a mini fridge that’s actually empty for keeping cold drinks handy. The complex is quite large and consists of several wings and levels. 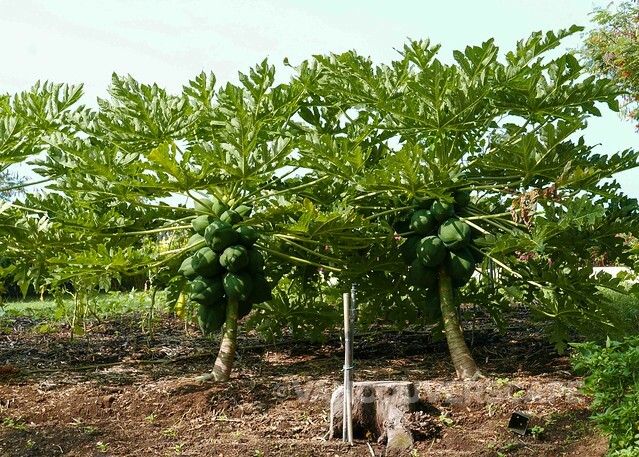 After a brief property tour the next morning, we discover an entire chef’s garden complete with Kaffir lime, bananas, herbs, mangoes, eggplant, coconuts, squash and other edibles. A conference center off to the side of the property has adjacent guest accommodation, perfect for weddings, meetings and other events. The fitness center contains Life Fitness equipment, treadmills, steppers and bikes, free weights, workout areas, steam room, sauna, massage rooms and ladies’ and gentlemen’s locker rooms. We’re not the only creatures content to escape a dreary wet winter to the northeast: the Golden Plover annually migrates all the way from Alaska to enjoy the balmy sun-splashed weather and tropical breezes. 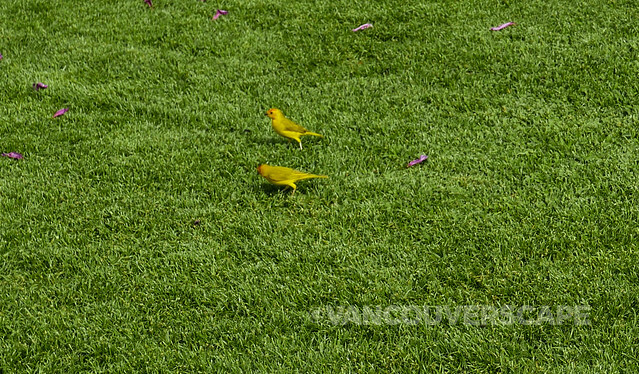 In fact, bird lovers will want to keep their eyes peeled for Saffron Finches, Myna birds, Java Sparrows, Red-Crested Cardinals and the ever-elusive Nene (a Hawaiian version of the Canadian goose). On our travels around the Big Island, we saw them all save the Nene, an endangered species also found on Oahu, Maui and Kaua’i. Beds are firm and comfy with high quality bedding. You can fall asleep to the sound of the ocean with the doors open (and full screens) or keep things cool with airco. 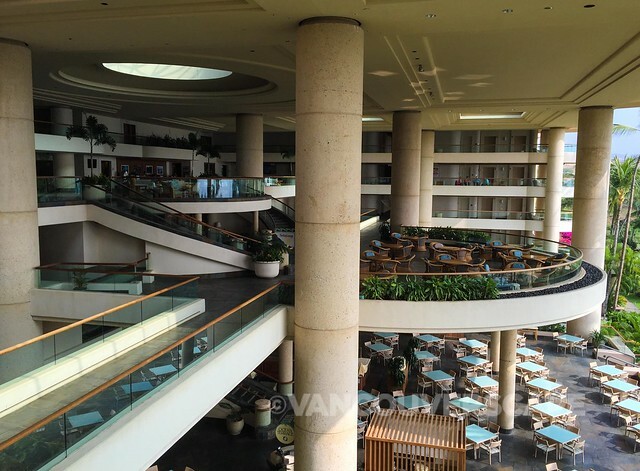 This hotel’s airco also shuts off automatically when it senses the balcony door open, a growing trend in eco-lodging. The refrigerator is smartly tucked away in another area of the room keeping potential hum out of our sleep picture. White wooden shutters close off for a dark room though if you keep the screen door open, it’s best to keep it open all the way so there’s circulation through the closed wooden slats. The Hapuna Beach Prince has three major restaurants as well as a few cafes and grab-and-go options for taking to the beach or on day trips. 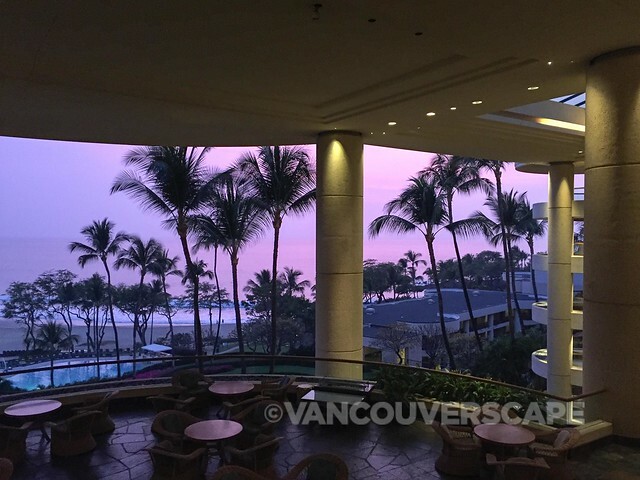 On our first evening, we dined at Coast Grille that overlooks both Hapuna Beach and the hotel pool. 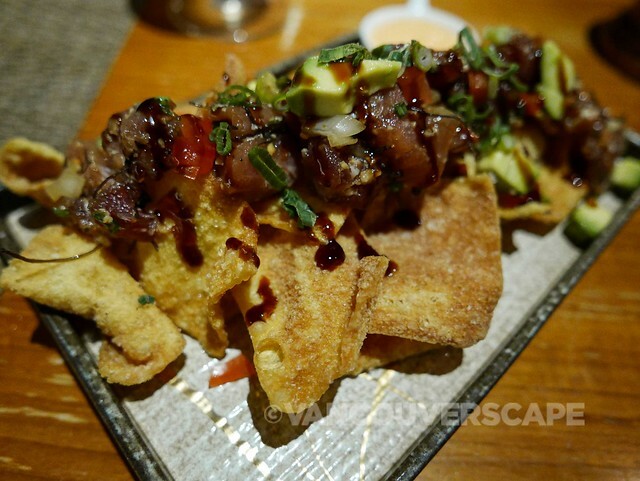 The menu features locally-grown Island cuisine including some of the best ahi poke we’ve had on this trip. Ahi poke has as many variations as restaurants that serve it. The Coast Grille serves it atop large crispy textured chips. 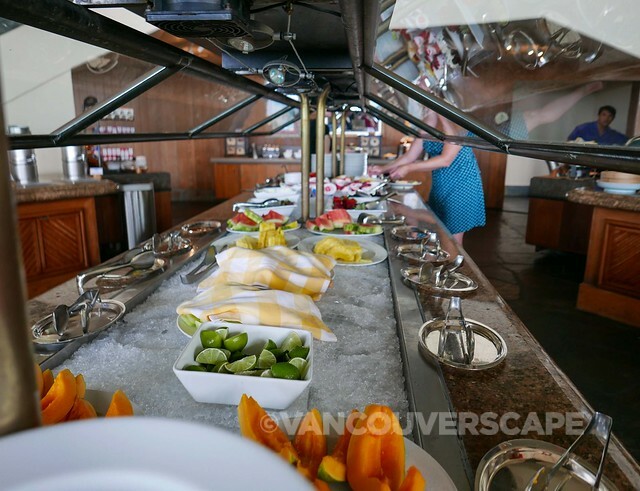 Ocean Terrace has a commanding view of the ocean and serves up a full buffet with made-to-order omelettes, fresh local fruit and a Japanese style breakfast with miso soup and accompaniments. On Fridays, a surf ‘n’ turf buffet features three different types of crab along with sashimi, Dungeness crab legs, crusted prime rib of beef, roasted turkey breast and other stretchy-pants goodies while Thursday through Saturdays, you can get your oyster on with fresh salt water-poached Kona abalone, seasonal oysters and design-your-own poke. 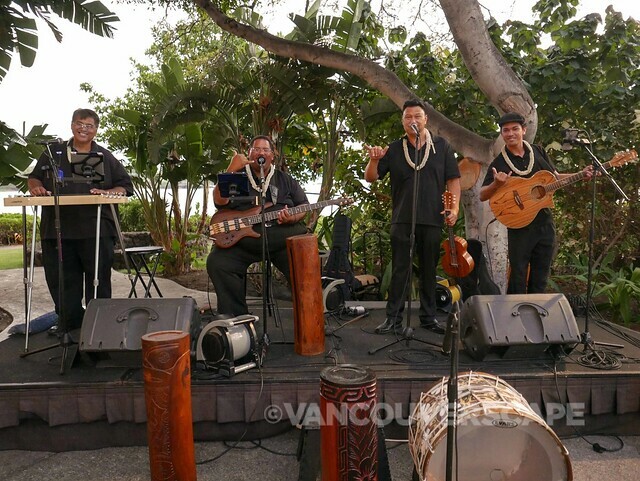 There’s also nightly entertainment at the Beach Bar from 5 to 8 so you can watch the sunset to live Hawaiian music. 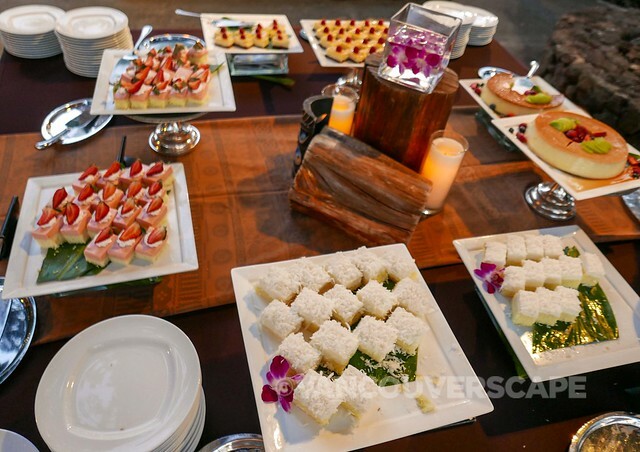 A free evening dining shuttle will whisk you off to the sister property, the Mauna Kea Beach Hotel, adding several more options without having to drive. A Hawaiian ocean front Luau is held twice a week at the Mauna Kea. 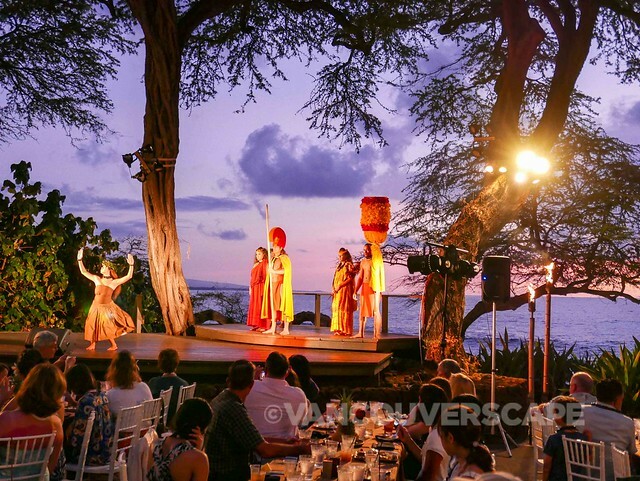 Between plates of Hawaiian dishes and a signature Mauna Kea Mai Tai, we’re treated to song, history and colourful highlights of Hawaiian culture in addition to Samoan and Tahitian dances. 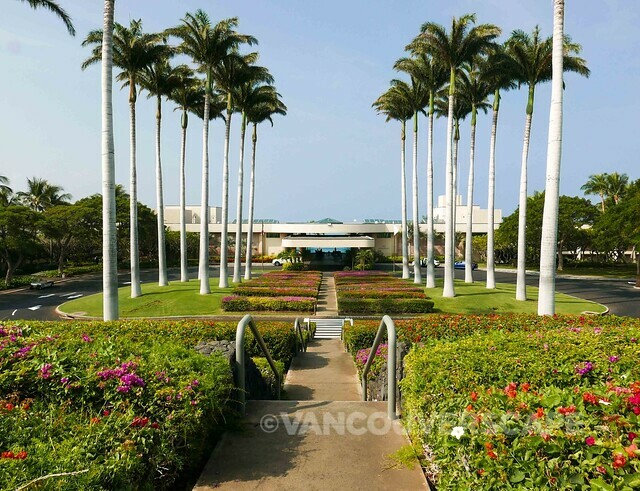 The iconic hotel, inspired by the Mauna Kea (“white mountain”) and founded by Laurance S. Rockefeller, is considered one of the world’s top three best-designed hotels in the world and last year celebrated a milestone 50th anniversary. 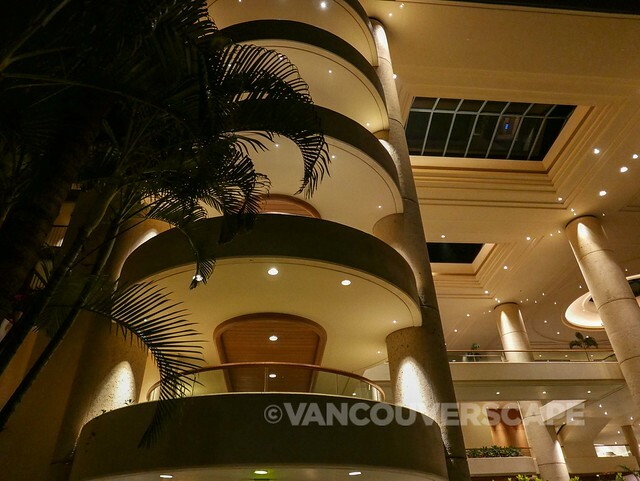 In fact, it’s worth a visit just to admire the property regardless of whether you’re staying overnight. Architectural firm Skidmore, Owings & Merrill were bestowed with an award of design excellence in 1967. 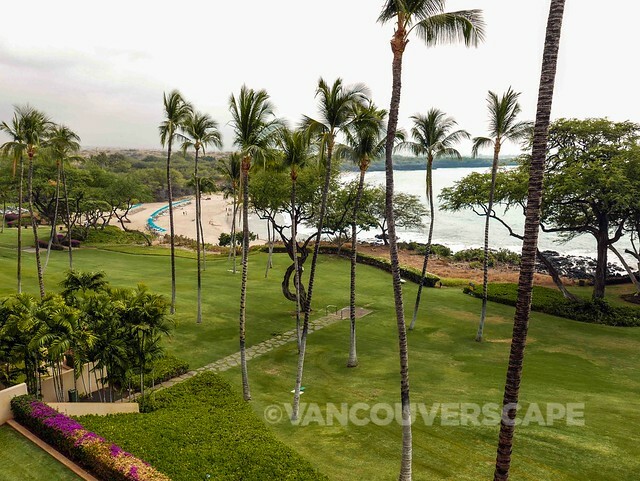 The legendary Mauna Kea is tucked amongst 60 acres of tropical foliage overlooking Kauna’oa Bay, one of the finest white sand beaches on the Big Island along with the Prince. If you’re here to golf, there’s an 18-hole course designed by Arnold Palmer and Ed Seay with stunning ocean views from nearly every hole. The daily $31.25 resort fee includes self parking, unlimited internet, two bottles of water, one hour of snorkel equipment for two, a bucket of range balls, and discounts to the spa and on golf merchandise. When you’re done splashing in the waves and frolicking on the island’s largest white sand beach, head north for a beautiful scenic drive along Highway 270. 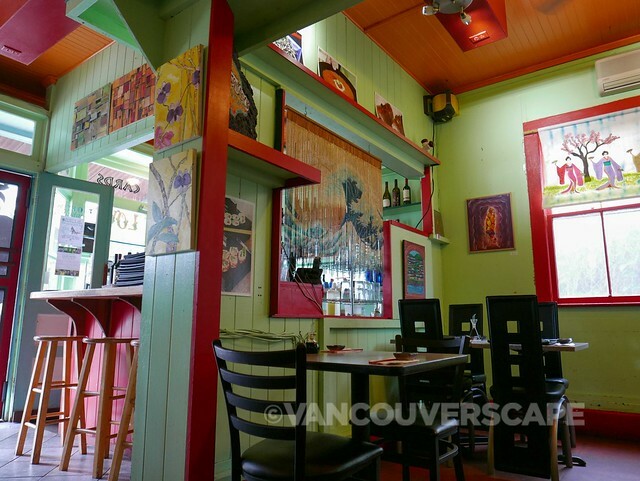 You’ll pass through Hawi Town, a laid-back little village where you can dine on some of the freshest catch of the day in the form of sushi at Sushi Rock. This nearly 13-year old establishment uses locally-caught Big Island fish in their rolls and dishes. We enjoyed the Sunset inside-out and Rock Star rolls. The colourful atmosphere compliments the names of their Special Rolls ($20 each): Magic Dragon, ’83 Eruption, Smoke ‘Em and Roll ‘Em, Capt ‘n Crunch and Ming Dynasty amongst the eclectic collection. 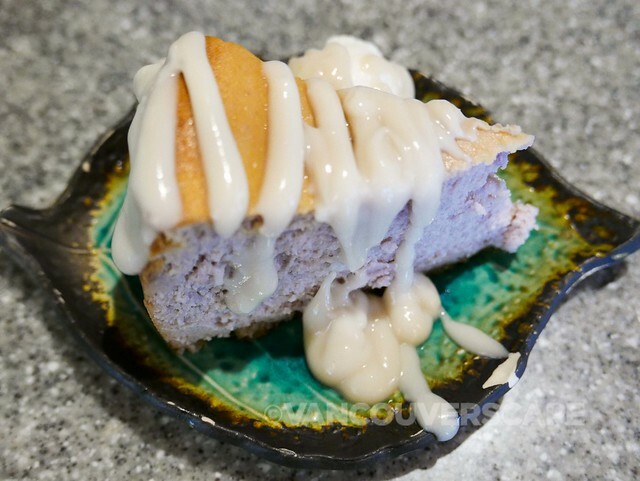 And whatever you do, save room for the epic (and I use the word sparingly) Purple Sweet Potato Cheesecake with macadamia nut crust and coconut maple glaze. Yum! 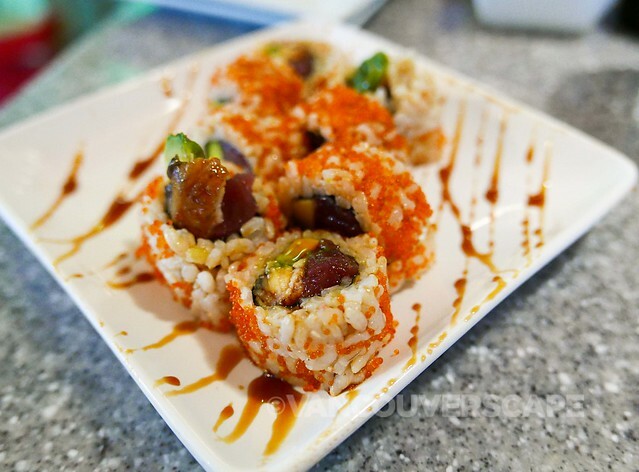 Sushi Rock is located at 55-3435 Akoni Pule Highway in Hawi. 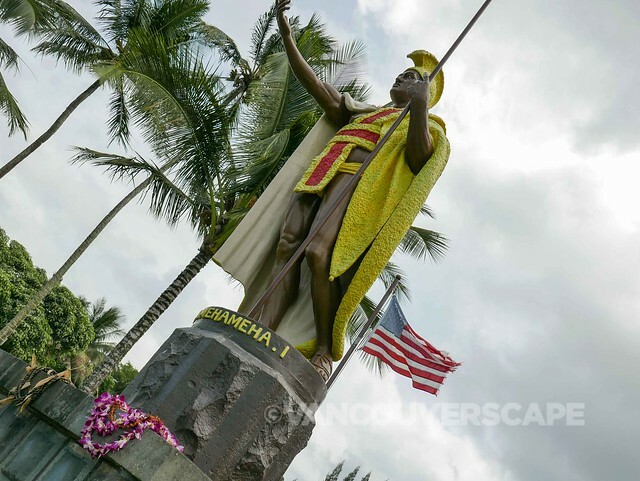 Further up that road to the right you’ll arrive in Kapaau, where in front of the North Kohala Civic Center you’ll find the colourful King Kamehameha I statue. A great warrior, diplomat and leader, King Kamehameha I united the Hawaiian Islands into one royal kingdom in 1810 after years of conflict. Kamehameha I was destined for greatness from birth. 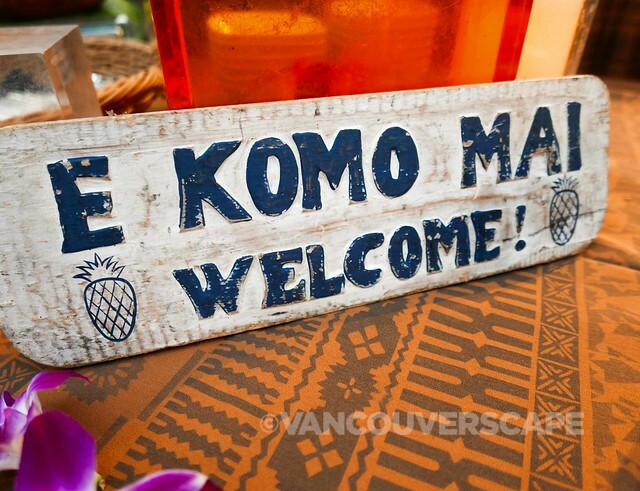 Hawaiian legend prophesized that a light in the sky with feathers like a bird would signal the birth of a great chief. Historians believe Kamehameha was born in 1758, the year Halley’s Comet passed over Hawaii. 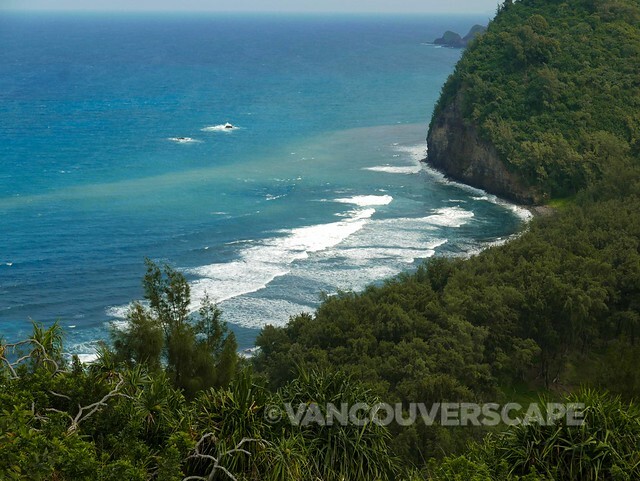 Another 10 minutes or so up the road and you’ve reached a dead end: Pololu Valley Lookout. 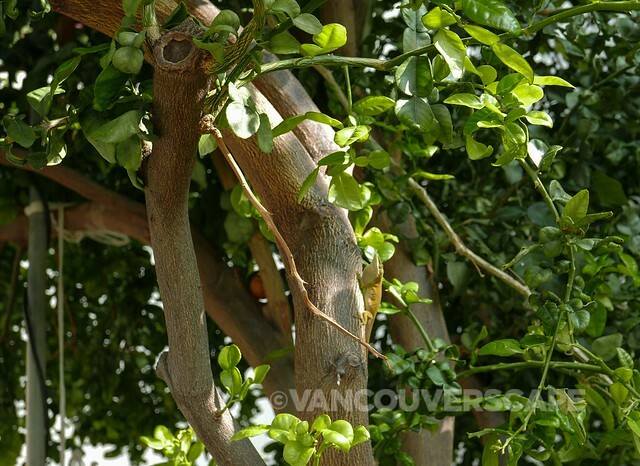 The nature is incredibly fertile and the view down to the sea spectacular. 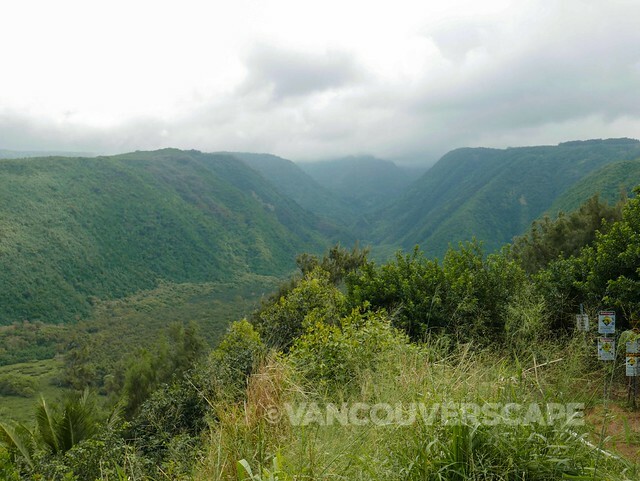 Return along Highway 250 for a complete change in scenery – ranches and green pastures for miles in either direction – before rejoining Highway 19 back to the Kohala coast. We’re continually in awe of the Big Island’s ever-changing scenery and climate, from beach to volcano, lush rainforest to characterful architecture, evoking the true spirit of Hawai’i. And if you’re lucky, at night you’ll be treated to a heavenly sky filled with shooting stars. We can’t recall the last time we’d seen a full set of twinkling stars, made all the more magical with balmy, tropical breezes and waves crashing against the shore in front of our lānai. As the Big Island’s social media hashtag goes, “Let Hawaii Happen”. We couldn’t agree more. A big Mahalo to Big Island Visitor’s Bureau for organizing our stay and activities and to Roam Mobility, a fantastic service for Canadians who want to roam free of hefty carrier charges while in the US and Mexico. Check out their talk/text/data plans. You can even sign up for one day. Special for Spring Break travellers: if you top up for Spring Break, you’ll be able to take advantage of 2x the 4G LTE data with any USA Talk/Text/Data or Data-only plans. Visit them online for details. Our Hapuna Beach Prince Hotel stay was courtesy of the hotel and Big Island Visitor’s Bureau. Opinions, as always, are my own. Unwatermarked photos courtesy of Hapuna Beach Prince and Mauna Kea Hotels.